A similar deal at Aldi in December (£10 more, but included stand, knife and steel) got to more than 700 degrees. Jamón Serrano is a wonderful centrepiece for any gathering of family or friends. Serve as a “Tapas” with cheese and olives, or add to your favourite Spanish recipes. Jamón Serrano is a dry-cured Spanish mountain ham that is seen as one of the cornerstones of Spanish gastronomy. The six to eighteen months curing transforms the ham, giving it lower moisture content and a firmer texture with an extremely intense deep flavour. These are great value and make quite a centrepiece, however they don't easily fit in most fridges. So once you get slicing, you really need to find a cool place to store them and get through them in a week or so, which is a big ask unless you invite friends & family around. You could store slices in the fridge, I guess. Otherwise they go putrid and you'll end up wasting most of it. Also in your description it says stand is included and later on it states ' Stand not included'?!?! OP is saying it was £10 more previously with those items included, now its £40 for only the leg? OP is saying it was £10 more previously with those items included, now … OP is saying it was £10 more previously with those items included, now its £40 for only the leg? Bought similar leg in France back on xmas. Lasted for 3-4 month, was kept in the fridge all time. Was waiting for this deal. Got 2 this morning. Ever been to a market in Spain or Italy? They have all kinds of dry cured meat hanging about in full sun. It's not the whole cured 'edges' that you need to worry about, they already have a protective crust of mould on them (which is fine). But when you slice into the ham, the new edible edge of meat will certainly go rotten in room temperatures like I said earlier. You can try to slow that down by covering with olive oil but the exposed meat is still going to go rancid same as if you left cured ham lying around the kitchen and not in the fridge. Another supporter for not keeping it in the fridge. 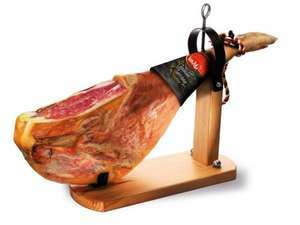 Having lived in Spain for some time, the only ham that they keep in the fridge is the vacuum pack of slices, not this. If anything, it goes a bit solid and you might have to cook the edge instead of eating it raw but it is gorgeous either way. You clearly have no idea of the curing process, it's not only the outside of the meat which is cured the whole joint is. Ah, a nice bit of tasty Tapas, a bottle of ice cold San Miguel, bliss! Hot OP if a tad chewy imo! Yep this is cheapo Serrano ham. Try to spend a few pounds more and do yourself a favour by buying Iberico. This is a good link. I have had 4 serrano hams from these guys and the quality has been superb. I would also agree with their advice on how long to keep a ham once you have started slicing it. The longest I have kept one going is about 10 weeks before it started to get past it's best. I concur, had many hams like this, they keep for ages. Only downside is that they tend to dry out a little, definitely do not go off. If you leave it a little too long between slicing you may have to sacrifice the first slice-only because it may be dry. Yep this is cheapo Serrano ham. Try to spend a few pounds more and do … Yep this is cheapo Serrano ham. Try to spend a few pounds more and do yourself a favour by buying Iberico. Best advice of all the comments. Iberico is not that much more than this but worth every penny imo. These are great value and make quite a centrepiece, however they don't … These are great value and make quite a centrepiece, however they don't easily fit in most fridges. So once you get slicing, you really need to find a cool place to store them and get through them in a week or so, which is a big ask unless you invite friends & family around. You could store slices in the fridge, I guess.Otherwise they go putrid and you'll end up wasting most of it. Whilst the 'foodies' are on her, how long will a full chicken last in the freezer? Best advice of all the comments. Iberico is not that much more than this … Best advice of all the comments. Iberico is not that much more than this but worth every penny imo. Do define not that much , twice the price ? Whilst the 'foodies' are on her, how long will a full chicken last in the … Whilst the 'foodies' are on her, how long will a full chicken last in the freezer? They tend to die a few degrees below freezing. Prob last a few months, must admit having chicken in the freezer for years, won't do you any harm, but quality will degrade over time. Wrap it really well. Probably because it was a small portion! As a Spanish 'jamon' specialist retailer the first thing I want to say is that this is by no means a sales pitch - simply to offer sound advice, all of which has been gathered from the Spanish themselves (in particular Spanish butchers and curing houses). Supermarkets have huge buying power and while this dictates price through substantial discounts from Spanish manufacturers quality suffers, there is a point where something 'too cheap' compromises the quality border making it no longer value for money and a Spanish Serrano Ham is a prime example - Invest in a good one and it will serve you and your tapas table well. At the end of the day that old saying 'you get what you pay for' is particularly relevant with Spanish ham. 'Deals' like this actually give us Spanish ecommerce retailers a hard time and I am sure our competitors will agree as a cheap Spanish ham rarely delivers the quality it deserves..
Yeah they tend to suffocate before they freeze to death! If you give it a jacket and a warm drink it may last longer. AFAIK, the reason these are so cheap right now is that Spain is completely economically screwed and they are struggling to shift them, even Jamon de Teruel which is usually the best. As for those suggesting Iberico or Pata Negra, that's going to be more than twice as much. And no, it doesn't need to be kept in the fridge.